Happy Hour: 3:00 – 7:00 P.M. Monday through Friday. 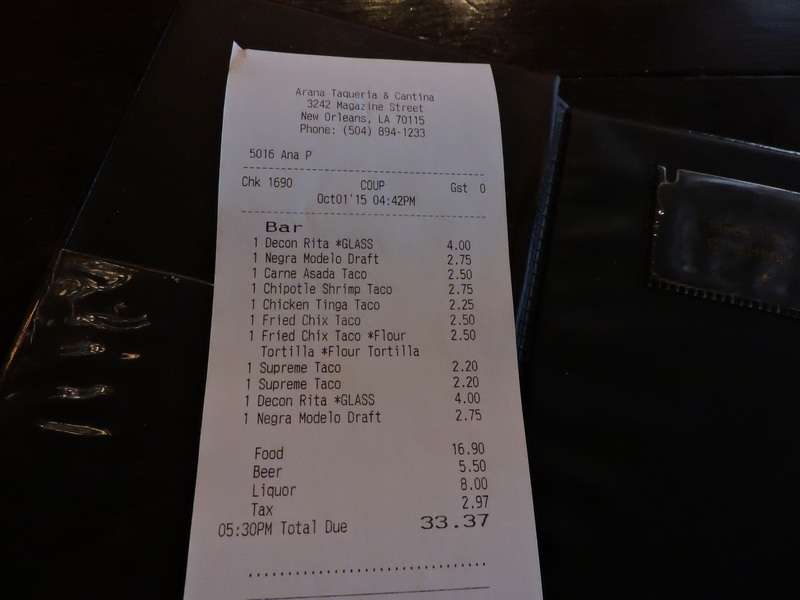 We’ve always been fond of Mexican food; it’s filling, comforting, and of course, cheap. 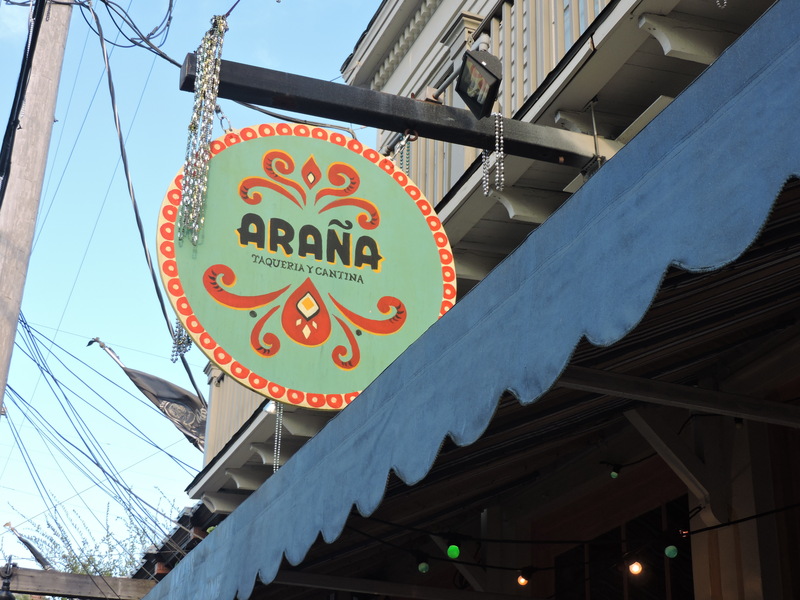 We have frequented this establishment many times prior to starting this blog. 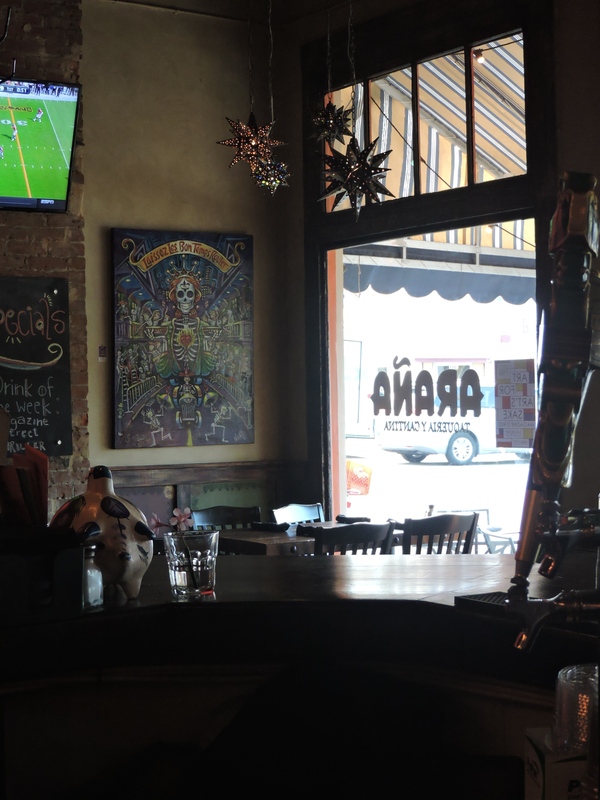 We were thrilled to learn that Kitty, one of our favorite New Orleans bartenders, now works here, although she was not on staff the night we were there for this review. If you are fortunate enough to stop by while she is working, she will make the experience even more enjoyable. It’s obvious by now how important customer service is to us, and she always goes above and beyond. Nestled amongst many beautiful restaurants and bars on Magazine Street, we were drawn in by the chalkboard sign outside that advertised half price tacos and all drinks. Once inside, we immediately shuttered at the loud salsa music, but stayed for the decor and intoxicating smells of Mexican food. The giant spider with the Day of the Dead mask on the wall certainly added to the authenticity. Tin star lights hanging from the ceiling set a dark, yet comfortable tone. Looking out on Magazine St. Drinks: You go to a Mexican restaurant, there’s a good chance you’ll get a Margarita. The options range from house, to seasonal, as well as their original creations. The seasonal drinks are made with the house made agua fresca, such as Strawberry Cucumber and Spicy Watermelon. Original creations are the Champagne Margarita and the Jalapeno Pineapple Cilantro Margarita. Other drink options include specialty drinks, such as a Mexican Mojito and the Bloody Maria. Tequila Flights are available to try three 1 ounce samples of different tequila, ranging from 18 to 50 dollars. As for those of us (Jay in particular) who lean more toward the pedestrian, the beer selection on tap limited to two standards. The bottled selection is much more extensive, including locals as well as Mexican. Nancy enjoyed the Deconstructed Margarita, which was lime juice, agave nectar and Sauza. 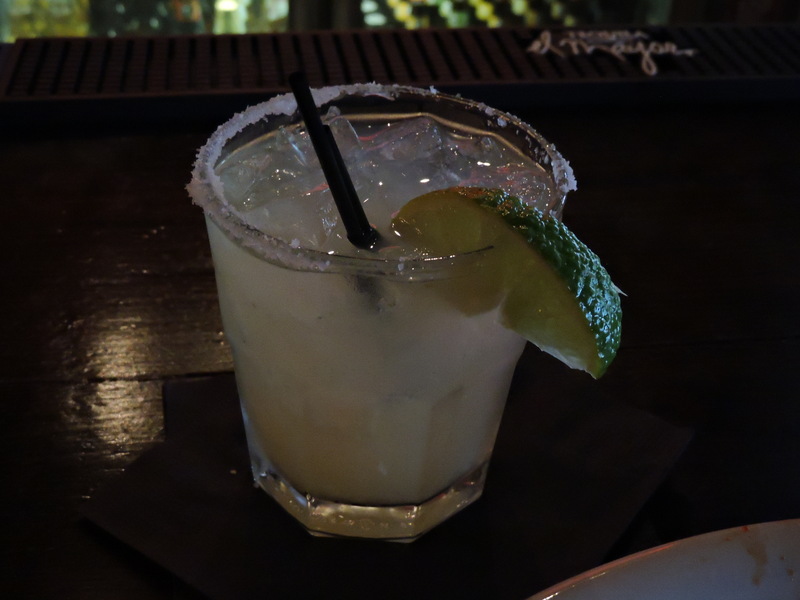 Light and refreshing, but lacking the necessary kick in the pants, so her second drink was the house Margarita, which rendered her docile and giggly. Jay had the Negra Modela on draft. When in Rome…sort of. No complaints. The menu consists of appetizers, soups, salads, sides, and traditional entrees. 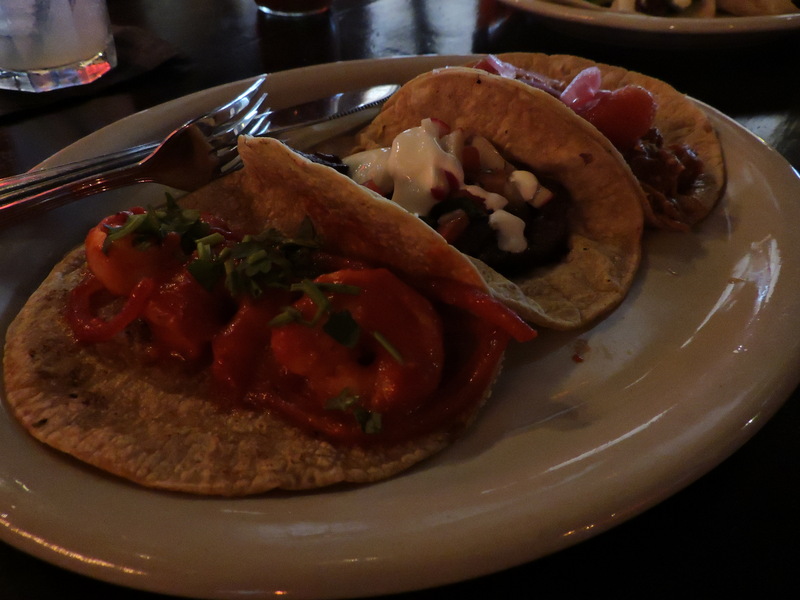 Many looked interesting, specifically the fried oyster tostada and ceviche, but we skipped right to the tacos. 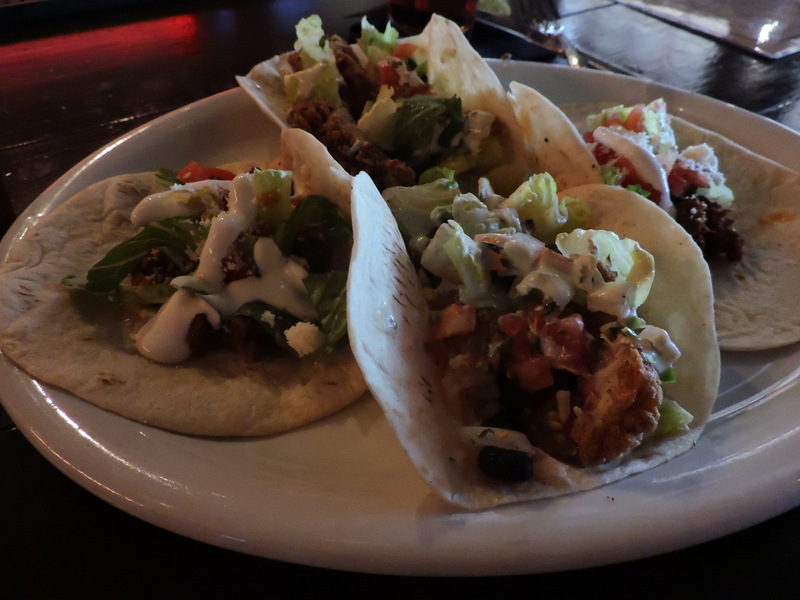 There are fourteen taco options, including tongue, duck, pork belly, beef, chicken, fish, and vegetarian. Jay consumed two Fried Chicken on flour tortillas, and two El Gringos with sour cream. Nancy had one Chicken Tinga, one Chipotle Shrimp, and one Carne Asada. Obviously, our tastes are considerably different. 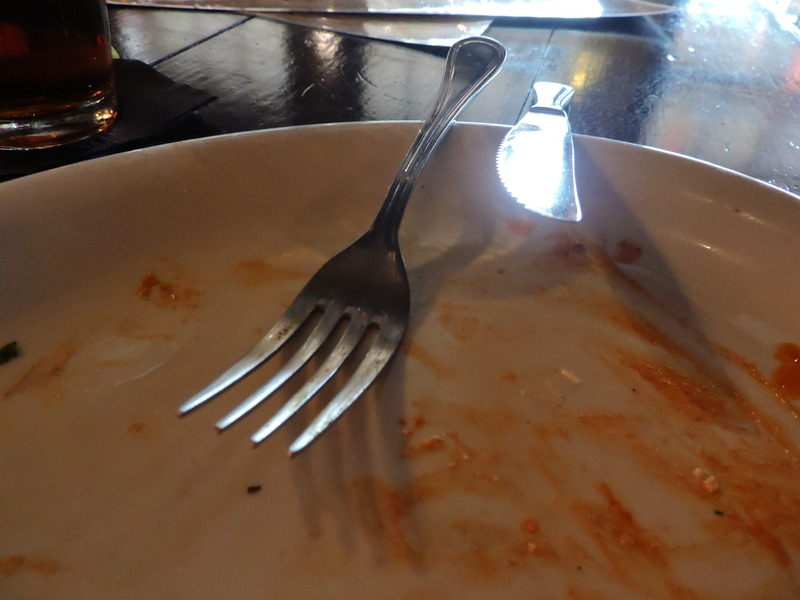 Jay always enjoys the El Gringo with seasoned ground beef, and was excited to see the fried chicken available. He was slightly underwhelmed, as it was essentially a chicken wrap in a tortilla. Nancy was impressed with hers, loving the pickled vegetables and cilantro. The Carne Asada was marinaded perfectly with an abundance of flavor. The only drawback is the soggy corn tortillas, easily amended with finishing the dinner with a fork and knife. No need to go elsewhere.